Democratizing Innovation and more at my upcoming talks! I am no product visionary, but I've always strongly believed that if you democratize innovation by removing most barriers between idea and execution, you have a greater chance of building something customers love. The idea is to let developers (and everyone else) freely express themselves through the products and services they build (essentially creating intrapreneurs), so they come to work everyday wanting to change the world! This is something I tried doing after joining Yahoo about three years ago: I interviewed a ton of engineers; found their pain points (i.e. barriers); found my partners in crime and been on a journey to eliminate most of those barriers (both technical and cultural). The macro goal? Velocity: rapid experimentation ("ship fast"), coupled with rapid invalidation of things your users don't care about ("fail fast"). 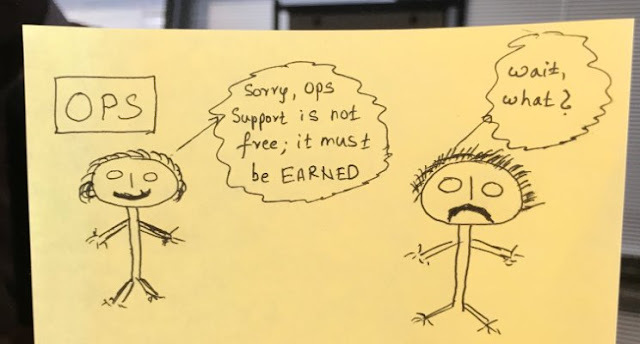 Come find out the challenges faced, the insights, and the lessons learned at one of my upcoming talks: "DevOps Enterprise Summit"- SF (Nov) ; @DevOpsDays - Bangalore / Kansas city (Sep). Hope to see you there! Want to Solve Over-Monitoring and Alert Fatigue? Create the Right Incentives!